Liquid Filling Machine Automation Levels - Zhangjiagang Modern Machinery Co., Ltd. The filling machine is an aspect of packaging process. Depending on the type of product material, it can be divided into liquid filling machine, paste filling machine, powder filling machine, filling machine granules. Typical of the liquid filling machine is the automatic beverage filling machine. The level of automation of production is divided into the tabletop bottle filler, the semi-automatic filling machine and automatic filling production line. Companies with relatively low production demands or limited space for packaging equipment make use of the tabletop fillers. Literally, these machines are placed on a table to allow for quick, consistent and accurate filling of product. There are a number of filling principles adopted by the tabletop machines which range from the fill-to-level overflow techniques to the volumetric filling via a piston or pump filler and other principles that are less common. The semi-automatic filling machines are also available from liquid packaging solutions and not just limited to the tabletop machines. The full-frame implies that the semi-automatic machines are built on the same frame as the fully automatic machines. The machines belonging to this category allow some more levels of automation than the tabletop fillers though some operator interaction is still necessary. The operator has some little work to do such as placing a bottle, activating the fill and also removing the bottle once filled. This is specifically for those companies with relatively high production demands. This category applies a wide range of filling principles as explained in the other types above. All that the operator does is to perform a set up on the machine before the actual production process commences. In most cases, the machine is pre-programmed for the product and bottle combinations before it is finally delivered to the facility. This means that the operator is only left with recalling the settings from the recipe screen and, the production begins. 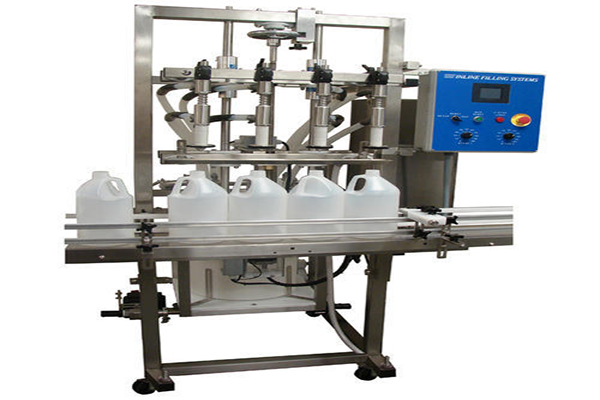 A good example of the fully automatic filler is the automatic beverage filling machine. It is applied in the packaging process of beverages. Empty bottles of boxes stacked on pallets, the conveyor belt to unload the pallet, the tank will be unloaded, the box will be sent to the unloading machine, the empty bottle of the box, empty box through the conveyor belt to the washing machine, washed clean, and then transported to the packaging machine, to fill the bottle filled with drinks. The empty bottle removed from the unloading machine must be disinfected and cleaned by another conveyor belt in the washing machine, which is inspected by the bottle inspection machine and enters the filling machine and the styling machine after cleaning. The bottle is loaded into the bottle by the load. The bottle with a good drink is sealed by a styling machine and is transported to a labeling machine, then sent to the packaging machine, and then sent to the pallet machine stacked on the pallet in the warehouse.